Hoof, Horace, and I were gathered around the table having breakfast and planning our day out, just like any normal family. On completion H & H put their cereal bowls and wine glasses into the dishwasher, folded their serviettes and put into the washing machine, so we were all set to saddle Hoof up and roar off on another adventure. First stop St Michael’s Mount to carry out a courtesy call on Denzil Penberthy and Slipalong Trevaskis. I am sure you know these two legends of Cornish folklore have been in charge of security at the Mount since about 1473, and thankfully there has not been any security breaches during their term in office. This is due mainly to the fact that Penbethy has this ability to drink any wannabe trouble maker under the table. Horace did not like this mode of transport at all so he dived off the AV and swam back, being a pig he can only do porky paddle. He was also muttering something along the lines of “where is my pink surfboard when I need it most”. 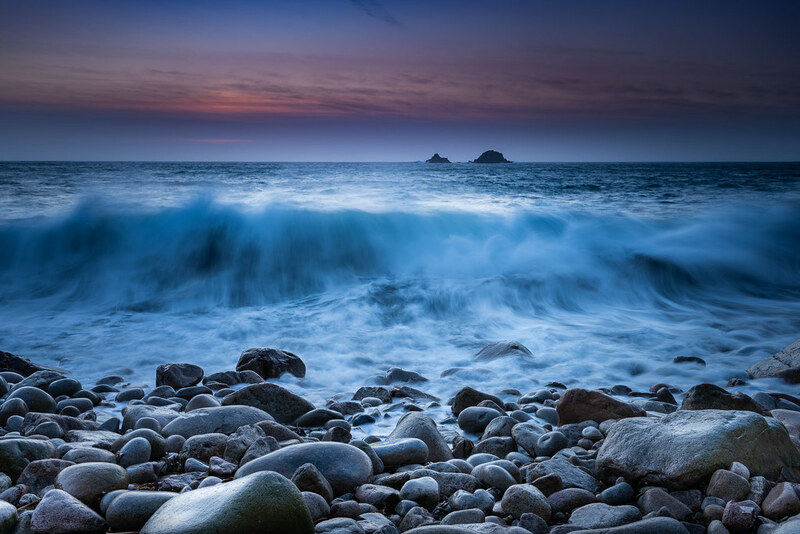 Next stop Porth Nanven located in the beautiful Cot Valley which is renowned for its fascinating smooth rounded boulders which are sometimes referred to as dinosaur eggs. This location has really challenged me with the weather conditions on my recent visits and this was going to be no exception. Hoof had recently been to the Land Rover factory where he had been fitted with the very latest on board weather forecasting radar screens (every horse should be fitted with these). Data from these showed that the evening was going to produce extremely high spring tides coupled with strong offshore winds creating very unpredictable conditions. The waves were coming in at great speed, force, and height, plus the noise of the boulders being dragged back down the beach from the power of the tide was like bombs going off. So the personal safety of Hoof, Horace, and myself was paramount. Therefore I just guessed some camera settings (no change there) waited for the right moment for a slight lull, quickly moved into position, grabbed a couple of shots and out of there, that way I can always come back and have another go one day.